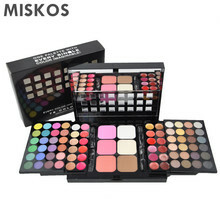 Set includes:48 color eye-shadow , 24 color lip gloss, 3 color Foundation face powder ,3 color blush. With 4 dual sponge applicators and a mirror, more convenient to use. No dye and will not leave a annoying eye-shadow mark.